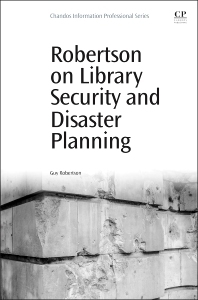 Robertson on Library Security and Disaster Planning presents a collection of highly-cited, author published articles on security and disaster planning for libraries. The book represents the only place where these articles are compiled, making it a go-to volume for practitioners. It includes topics covering all aspects of preparation and response, along with articles drawn from library journals, including Feliciter, Canadian Insurance, Disaster Recovery Journal, and Canadian Bookseller. The book represents a wealth of the author's experience and expertise garnered during a distinguished career working with significant institutions on both their current security problems and their plans for future security.